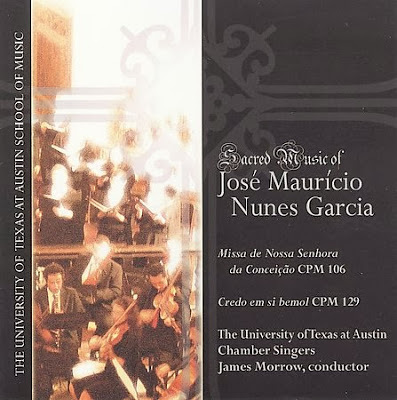 Portrait by José Mauricio Nunes Garcia, Jr.
Sacred Music of José Mauricio Nunes Garcia; Missa de Sonhora da Conceição CPM 106; Credo em si bemol CPM 129; The University of Texas at Austin Chamber Singers; James Morrow, conductor; Longhorn Music LHM2007003 (2010). From Nunes Garcia are known 240 musical pieces, but research shows that his actual production would be almost twice this number. This quantity, and the quality of his works made him one of the most important composers of Brazil, in most of his lifetime a colony of Portugal. Today, thanks to the outstanding work made by musicologist Ms. Cleofe Person de Mattos (1913-2002), the main facts of the composer's life are established, and his remaining works are cataloged. To her memory we dedicate this website. Her mother was Joana Gonçalves, a slave of Simão Gonçalves, and Apolinário was son of Ana Correa do Desterro, and they both had no known fathers, that is another way to say they were both their landlord´s children. The child was born in Rio de Janeiro on September 22, 1767. Antonio Campos Monteiro Neto tells us an aunt lived with the family and helped raise young José Mauricio after his father died in 1773. One way they aided in his development was to ask their friend Salvador José de Almeida e Faria to share his education in music with the youth. 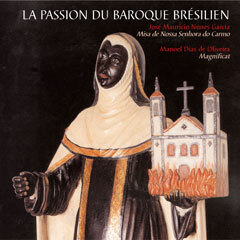 Monteiro Neto relates that some evidence indicates that José Mauricio sang in the choir of the Cathedral of Rio Janeiro as a soprano. He adds that choir members attended the Seminary of St. Jacques, where they were taught to read Music, Greek and Latin. According to Manuel de Araújo Porto Alegre, his early biographer, he had "a beautiful voice and a great musical memory"; "reproduced everything he heard", and "created melodies of his own and played the harpsichord and the guitar without ever have learned to". In 1779, at twelve, he began to teach music. José Mauricio never had a piano or a harpsichord, and trained himself by teaching harpsichord to the society´s ladies. To learn the organ, he was assisted by some good organists in the churches. José Mauricio completed his education in the "Royal Classes", with lectures in history, geography, latin grammar and philosophy, and rhetoric as well. At 16, José Mauricio composed the first work that came to our days: the antiphon Tota pulchra Es Maria (CPM 1) in 1783, dedicated to the Cathedral and See. During the decade of 1780, he studied the necessary disciplines to the examinations he had to go through to be ordained a priest, and began a collaboration with the old chapel master of the See, deacon Lopes Ferreira. This would be the first step to his final goal, to be Lopes Ferreira´s successor as the See´s chapel master. In 1784, a group of musicians founded in Rio de Janeiro the brotherhood of Santa Cecília, whose objective was to regulate their professional life. José Mauricio signed the foundation act as a music teacher. At this time he composed the following works: Litany for Our Lady in 4 voices and organ, in 1788, the anthems O Redemptor Summe Carmen and Pange Lingua, in 1789, and the works a capella "for all the Holy Week of the See" (Bradados), from those the most important is Bradados de 6ª feira maior (CPM 219), for Holy Friday, which includes the motets Crux Fidelis (CPM 205), Heu Domine (CPM 211), Popule Meus (CPM 222), Sepulto Domino (CPM 223), and Vexilla Regis (CPM 225). In 1790 he composed an instrumental work that made him famous in Rio de Janeiro: the Funeral Symphony (CPM 230). He requested his ordination in 1791. The ecclesiastic career would join his religious education and his musical art, and compensate his low origin as well. Two requisites to be ordained were: to prove the true Catholic faith from himself and from his parents, and to be free from "any colour defect". The first had been proved through research and witnessing from his parents' and grandmothers' friends on their faith. To overcome the second obstacle, he requested from the bishop to be dismissed from his "defect", in which he was successful. In June, 1791, he began the necessary examinations. In March, 1792, he was ordained. The last requirement, to own any asset, was gone through with the help of one of his student's father, Thomaz Gonçalves, who gave him a house at Rua das Bellas Noutes. In 1791, having all his time dedicated to the studies, he wrote just one piece of music, a Te Deum for the "successful arrival" of Dom Luís de Vasconcelos in Portugal. This same year, he joined the brotherhood of São Pedro dos Clérigos. In 1795, he became a public music instructor, giving "Royal Classes" of music for free, in his house at Rua das Bellas Noutes. Great musicians and singers had their musical education in his class. They would enrich Rio´s musical stage in the 19th century. After he was accepted as a priest, José Mauricio had a time of great productivity, creating 32 new pieces of music, among them graduals, antiphons, various psalms, a Magnificat (CPM 16) only for voices, the vespers: Vésperas das Dores de N. Srª. (CPM 177) , Vésperas de N. Srª. (CPM 178) , in 1797, several works for Holy Week: two Miserere, one for Holy Wednesday (CPM 194), and the other for Holy Thursday (CPM 195), and his first mass, Missa para os pontificiais da Sé, in 1797. His dream of being master of chapel and preacher of the See became true. One of his attributions was to compose, when requested by the Senate, pieces of music for religious feasts, and for important events such as marriages and the birth of a prince in the Portuguese Royal Family. Among these first works was a Te Deum in thanksgiving for the birth of prince D. Pedro, in 1798. In 1799 he joined the brotherhood of Nossa Senhora do Rosário e São Benedito dos Homens Pretos, in whose church the See was installed. This same year he composed the Officium for the Dead (CPM 183) and a Requiem Mass (CPM 184), in honor of the dead priests, probably a personal tribute to Lopes Ferreira, and the Christmas Matins (CPM 170). He took part in meetings at the Literary Society, founded in 1794, until its closing and the arrest of its leaders in 1797, after they had been accused of revolutionary activities against the Portuguese Crown. Among them was Manuel Inácio da Silva Alvarenga, from the city of Vila Rica, who had relationship with the condemned leaders of the insurrectional movement in the province of Minas Gerais. Silva Alvarenga made appear in him a deep feeling of his national identity, which reflected into his sacred works from this time, in which adapted brazilian popular and folk songs were inserted. At the end of the century, he moved to his house at Rua das Bellas Noutes, taking part in the "serenades" near the Public Garden. From this time three Modinhas were composed, printed by music editor Pierre Laforge in 1837: Beijo a mão que me condena (CPM 226) - I kiss the very hand that condemns me, Marília, se não me amas (CPM 238) - Marília, if you don´t love me, and No momento da partida, meu coração t´entreguei (CPM 239), - At the moment of departure I gave you my heart. A copy of these two last works has been recently found in Germany. As it was usual in the Brazilian society, despite prohibition, José Mauricio had Severiana Rosa de Castro, born in 1789, as his wife in the first two decades of the 19th century. From this marriage six children were born, and five of them survived: Apolinário José in 1807, José 1808 (the only one he recognized to be his son), Josefina in 1810, Panfília in 1811 and Antônio in 1813. 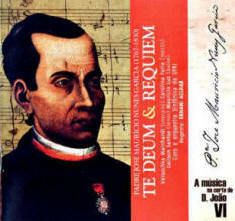 With exception of these two pieces, few other works composed between 1800 and 1807 have survived to present days: two graduals, the motet Te Christe Solum Novimus (CPM 52), written in 1800, the Te Deum para as Matinas da Assunção (CPM 91) the Mass in B Flat (CPM 102), both written in 1801, and the antiphon In Honorem Beatissimae Maria Virginis (CPM 4), written in 1807. The admission of the Brazilian ministries had been officialized. But the Portuguese priests thought otherwise: in an anonymous document, they stated that, as a measure of economy, the ministers should be limited to those who served previously Dom João. This would spare him to see in his chapel someone with a "visible physical defect". The someone with a "visible physical defect" was the See´s chapel master. That was only the beginning of a series of aggressive actions, with the objective of humiliating the man they considered to be of an inferior race. But Dom João recognized his musical gifts, and confirmed him, on November 26th, as the master musician of the Royal Chapel. José Mauricio was officially the first musician of the kingdom of Portugal. The musical ensemble of the old See did not please Dom João, nor its repertory. To improve its quality, he ordered the musicians from the Royal Chapel of Lisbon to come to Rio. 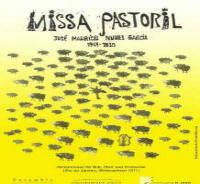 To José Mauricio he left the task of composing new works. About 70 music pieces were composed from 1808 to 1811, to ornate with music various solemnities. Still in 1808, Dom João conceded to José Mauricio the "ração de creado particular" (a benefit for personal servants), an honor that made him equivalent to any other Portuguese servant of the Crown. But the musicians from Lisbon were acquainted with another musical style, and not satisfied by being conducted by whom they considered inferior, acted as a group making pressure against him. This year he made two pieces for stage plays, whose author was Dom Gastão Fausto da Câmara Coutinho: Ulissea, Drama Eroico (CPM 229) and O Triunfo da América (CPM 228) - The Triumph of America. The soloist for the two plays was Joaquina Maria da Conceição da Lapa, a Brazilian soprano. José Mauricio was also made a knight in 1809, much to the consternation of staff members. Monteiro Neto relates that the Chapel Master was required to pay his performers in advance, and seek reimbursement later. Payments due to him were delayed so long that he was forced to mortgage his house to meet his payroll. We are also told that his new duties as archivist of music brought from a palace in Portugal gave him new insights for composing. Another serious setback occurred when the Chapel Master of Lisbon, a brilliant and cultivated composer and organist named Marcos Portugal, arrived in 1811 and persuaded the Senate not to renew José Mauricio's contract as Chapel Master. Marcos Portugal became his successor. A serious illness led the Senate to temporarily reinstate José Mauricio as Chapel Master, but Marcos Portugal recovered and reclaimed the position. In 1812, José Mauricio also lost the position of organist. It is not known where Vitória Maria was buried. But the sorrow of her son would be revealed in his Missa de Requiem (CPM 185) - Requiem Mass and in the Ofício dos Defuntos (CPM 186), - Officium for the Dead, requested by the Ordem Terceira do Carmo to their funeral mass in the memory of the queen. These are regarded today as his two masterpieces. On July 4th Fortunato Mazziotti was nominated master of the Royal Chapel. This nomination was a way to make clear to José Mauricio he would work no more for the Chapel. The excellence of all musicians made the people gather in Largo de São Jorge, near the house where José Mauricio lived, to hear the rehearsals. The priest composed for this ensemble a series of 12 Divertimenti, received with enthusiasm, and whose original scores were taken with them to Europe, disappearing there. Portugal's state of health made the year of 1818 productive again to José Mauricio. The year 1817 was also when José Mauricio Nunes Garcia composed the first Brazilian opera, Le Due Gemelle (The Two Twins). His output in 1818 included, we are told by Monteiro Neto, a Novena (CPM 67), a Mass for the Feast of Our Lady of Carmel (CPM 110), a Qui Sedes and Quoniam (CPM 163) and three Motets, as well as a Mass for Feast of the Beheading of St. John the Baptist. We are further informed by Monteiro Neto that in December 1819 he conducted the first Brazilian performance of Mozart's Requiem (K 626). In 1825, a fire in the Royal Theater turned the score of Le Due Gemelle into ashes. In 1826, Dom João died in Portugal, of a suspected poisoning. The news of his death turned José Mauricio's mood into sorrow. This year, two of his scholars, on behalf of the brotherhood of Stª Cecília, requested him a new mass with great orchestra, that would be his last work: the St. Cecilia's Mass (CPM 113), presented this same year in november. 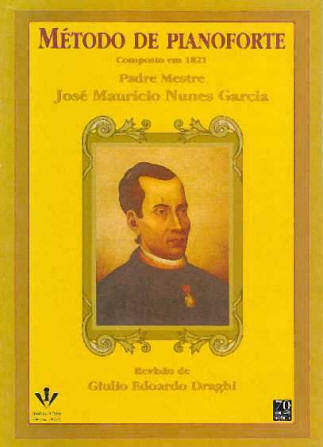 It is a monumental work (276 pages), and the score was later donated by his son Dr. José Mauricio Nunes Garcia to the Instituto Histórico e Geográfico Brasileiro, when he joined this institution. From 1826 to his death in 1830, José Mauricio dedicated himself to review its orchestration, and he wrote a Treatise of Harmony and Counterpoint, now lost. In 1829, he resigned to the title of Knight of the Order of Christ, on behalf of his "nephew" José, who he recognized to be his son in 1830. In the beginning of 1830, it seems he had lost his house again. He was living in a small house at Rua do Núncio (now República do Líbano street). In February 1830 Marcos Portugal died, and he was buried in the Convent of Stº Antônio. José Mauricio, perhaps guessing it was his turn to die, made his bed to be put in the first floor of his house, "not to bother anyone". In April 18, being present his son and a slave, he passed away, whispering an anthem to Our Lady. At the heart of the creation of Brazilian musical history, José Mauricio was considered by his contemporaries to be a peerless organist and an excellent improvisor. His first period of creativity, which ended with the arrival of the royal court from Portugal, was defined by a refined and elegant melody in the manner of Haydn and Mozart. The University of Texas at Austin Chamber Singers and Orchestra perform on this recording under the direction of Dr. James Morrow, conductor. The CD was released and is copyrighted by Longhorn Music, The University of Texas at Austin Center for American Music, LHM2007003 (2010). The Mass on this recording was composed in 1810, at which time the Royal Chapel had more than one hundred musicians comprising renowned Brazilian and Portuguese singers and instrumentalists, as well as Italian castrati. This group was conducted by José Mauricio Nunes Garcia (1767-1830) from 1808 to 1811 and then by the famous Portuguese composer Marcos Portugal, who arrived towards the end of Nunes Garcia's term as conductor. By the time of his tenure at the Royal Chapel, Nunes Garcia's music was strongly influenced by Italian opera from the beginning of the 19th century, whose iconic composers included Paisiello and Cimarosa. Nunes Garcia's music was also tied to the musical life of Portugal through the compositions of Marcos Portugal and Antonio Leal Moreira, both well-known composers in Brazil. The most emblematic, creative, and important work of this period is the Missa de Sonhora da Conceição (Mass of Our Lady of Conception) 1810, C.P.M. 106 (Portuguese abbreviation for Cleofe Person de Mattos's catalog of Nunes Garcia's works). Nunes Garcia put into practice all the techniques and coloristic possibilities of the orchestra he conducted.